On-site ponds and lagoons serve as a depository for waste in many pulp and paper manufacturing operations. The waste takes the form of sludge consisting of a combination of solid and liquid materials. Over time, the solid sludge will accumulate, which can severely limit available pond space — and create an unpleasant odor that permeates the entire property and surrounding areas. Dredges: A paper mill pond dredge system will excavate sludge from the bottom of the waterway via a submersible pump that creates suction, much like a powerful vacuum cleaner. The sludge can then be treated and transported for proper disposal. 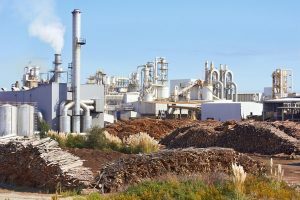 Aerators: An aerator for paper mill pond applications will improve the quality of water through oxygenation, which can also help to eliminate the putrid odors that characterize many paper manufacturing operations. Dewatering: Dewatering tubes and related equipment can maximize the water content recovered from the dredged sludge and minimize the amount of solids that require disposal. GeoForm International offers an assortment of hard-working, efficient pulp and paper mill sediment removal equipment that can make the job so much easier. Contact us to learn more today.